Better known as free quality TV. (SPOT.ph) Why would anyone produce a series and air it on YouTube? These actors must be incompetent. The production value is probably worthy of a grade school stage production. We’re baffled too, but it’s 2014! Why not make quality web series? Everybody’s always looking for the next time-wasting video that doesn’t require an hour to load. So sit back, relax, and get ready to get swept up in these amazing, funny, and moving series just a click away on your very browsers. Imagine Pride and Prejudice set in the present day. Elizabeth "Lizzie" Bennet is an avid video-blogger, sharing the ups and downs of her life with her sisters Jane and Lydia, her best friend Charlotte, and the irritating yet intriguing boy next door, Darcy. High-society balls are just regular nights out, Pemberley Estate is now a company, Pemberley Digital, and Kitty Bennet is...uh, a kitty. We think Jane Austen would be pretty proud how her story of society, love, and family manages to stay relevant today. If you need more convincing, Hank Green (as in John Green’s brother) is one of the series’ co-creators. A sequel of sorts to The Lizzie Bennet Diaries, this series takes on another Jane Austen classic and gives it a fresh, modern spin. Emma Woodhouse thinks she can fix anything, including people’s failed love lives. It’s kind of like Clueless (which was also based on Emma), but think of Cher as a budding entrepreneur. This version of Emma remains incredibly fashionable, though! Saying this series is like GIRLS poking fun at itself doesn’t do Broad City justice. A pair of twenty-something gals are not just trying to survive New York City, they’re trying to have fun along the way too. It’s slacker humor...for girls! But at the heart of this show is the beautiful, supportive friendship between Ilana and Abby. Even Amy Poehler has given this series her stamp of approval and has produced it for TV. Big-time celebrities are discovering the power of the Interweb. Jerry Seinfeld takes us for intimate rides with some of our (and his) favorite funny people in Hollywood like Tina Fey, Chris Rock, Alec Baldwin, and David Letterman. Every episode features a different car, one which Jerry usually picks out to reflect the personality of his guest of the day. They’re just famous people driving around and getting coffee, but they’re clever and comedic, so expect some great and hilarious stories along the way. If you’re wondering what Phoebe Buffay has been up to, sit down and consider how you clinging to the past might be slowing your growth as a person. 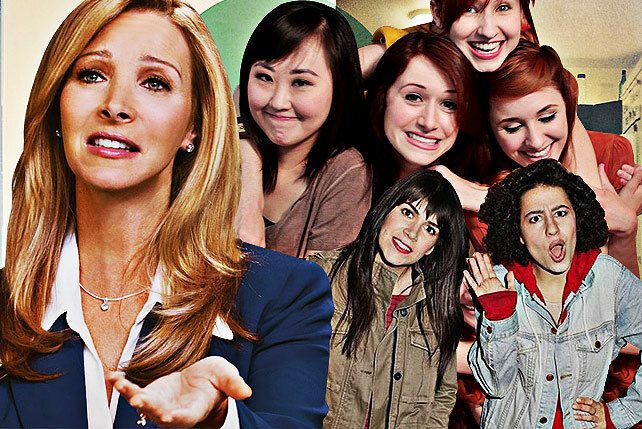 Lisa Kudrow stars as Fiona Wallace, a therapist who works with patients via webcam. Much of the humor comes from how Fiona is more interested about getting things done than working things out. She can get emotions and reactions quickly out of a patient...but only for the sake of more juicy footage for her innovative therapy method. And look out for a mini FRIENDS reunion because Matt LeBlanc and David Scwhimmer guest star in some episodes. Two girls are on the look out for paranormal phenomena. But fear not! This is a comedy. It’s like if the Ghostbusters were run by two slackers. Heidi and Angelica get to run into some famous folk along the way too, like Dave Grohl, Jason Schwartzman, and Val Kilmer. Jack Black also happens to be one of the series’ executive producers. Wouldn’t History class have been more fun if the teacher was drunk? Imagine the lives of each of our nation’s presidents told by your professor with a bottle of rum in hand. Drunk History gives us just that. Except the history is narrated by comedians and even better, acted out by the likes of Michael Cera, Ryan Gosling, Don Cheadle, Will Ferrell, and more. This Ben Stiller-produced series is a parody of reality dating shows like The Bachelor and much like its subject of parody, there’s a single man or woman and a group of people competing for his or her love. But unlike the reality dating shows, Burning Love is scripted and features familiar faces like Kristen Bell, Ken Jeong, Malin Akerman, as well as Ben Stiller. Follow the fascinating life of Mary-Kate Olsen as portrayed by Elaine Carroll. Her over-the-top impersonation includes Mary-Kate’s signature boho chic style and that familiar pout-smirk. In this universe, Mary-Kate attends NYU, is obsessed with calories, and has a penchant for power drinks mixed with a variety of drugs (Mango Klonopin smoothies and Celexa Mimosas). When Neil Patrick Harris falls asleep, his dreamworld is filled with...puppets! Under The Jim Henson Company, this series puts you in the colorful and wacky world of Neil’s dreams. It’s Neil Patrick Harris and puppets! There’s even a Bollywood musical number in one episode. What’s not to get excited about?